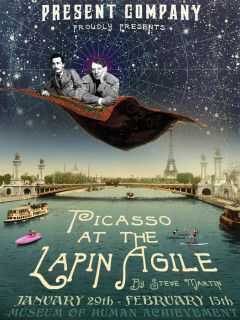 After years of producing their wildly successful Shakespeare series, Present Company is thrilled to launch their contemporary programming with Steve Martin's surreal comedy, Picasso at the Lapin Agile. According to Present Company, this surreal, space-time continuum-bending immersive theatrical experience is hysterical by historical proportions with a visual arts aperitif and a lucid dream chaser. And an accordion. Cast with some of Austin's finest actors, the production will also feature an art exhibit and music from Bluesqueezebox's Clif Tipton. The exact address of The Museum of Human Achievement will be provided with your ticket reservation. Admission is free, but an RSVP through Eventbrite is required and there is a suggested donation of $25. VIP tables are available for purchase. The show will run from January 19 until February 15. Admission is free; RSVP required; Suggested donation of $25.